Not many airfields have the view that Pyramid has to offer. Organiser Peter Lea with some of the visiting in the background. "This is our third fly in. The first one was well attended; the second was completely washed out and only one aircraft arrived. The year after that I lost courage but as I flew to the different airshows and other events I was continually requested to organise another one. We moved the date from September, the Lowveld's rainy season to August and we've had more planes arriving on Friday night than ever before and today, Saturday, its full and humming. 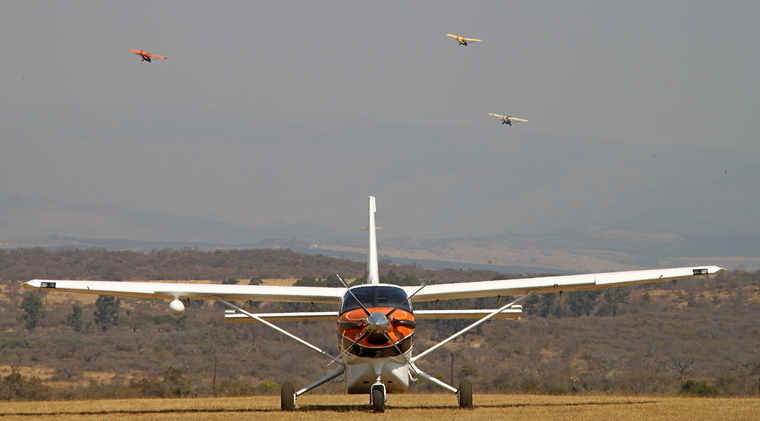 Our fly in is the ideal opportunity for the people from the Rand to come and experience typical Lowveld hospitality." Peter said. 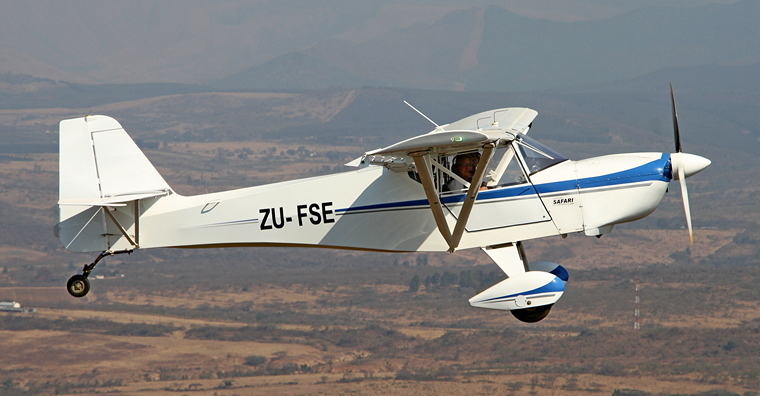 Pyramid Airpark, not to be confused with Barberton Municipal Airfield, is one of the undiscovered jewels of one of South Africa's most scenic provinces, Mpumalanga. About ten kilometres from historic Barberton and fringed by the majestic Makhonjwa Mountains this privately owned airpark has two grass runways, 30/12 - 35m by 780m and 33/15 - 25m by 1200m and only ten hangar stands, only two of which have not been sold. (Make a note to read out follow up article on the air park to be published soon). Barberton was established in 1884 when Fred and Henry Barber and their cousin, Graham, discovered gold here. On 24 July 1884 the Gold Commissioner, David Wilson, christened the reef with a bottle of gin, champagne not being available, and named the place Barberton. During the weekend of 11 and 12 August just slightly more than 40 aviators arrived at Pyramid Airfield by air whilst some more opted to drive for a weekend of flying, fun and camaraderie. However, numbers means little; what counts is the fun to be had when likeminded people meet and at Pyramid there were buckets full of that. This was Andrew Evans's second visit to Pyramid. Andrew and Andre Burger flew in from Kittyhawk. He said, "We basically looked at a map, drew a line that showed a heading of 104, a 135 miles, a quick calculation and we knew that it would take us a hour and fifteen minutes at roughly 100-105 knots. We pointed the aircraft east, stayed low and landed on runway 12 and parked at Peter Lea's hangar. Breakfast was superb." They wanted to camp for the weekend but because of other commitments, his daughter was flying a Lambada at Brits, they could not. 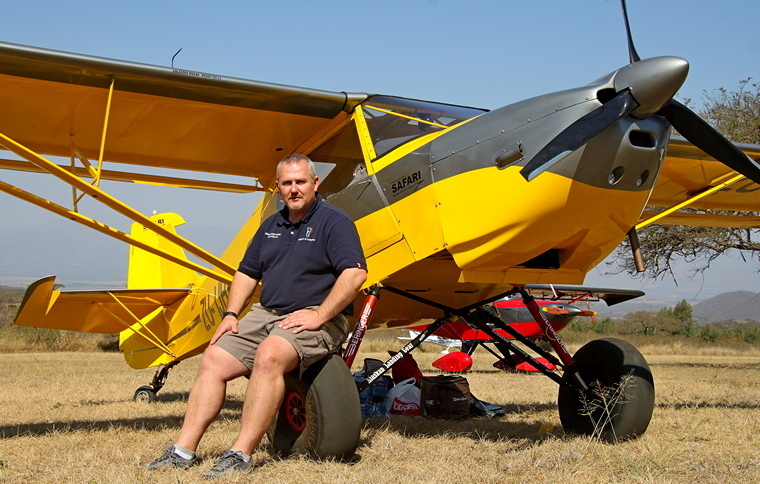 Cheryl Smit went for a flight in Kobus Visser's in his Kit Planes for Africa Safari. Henri Westerman flew a dawn patrol in his authentic 1946 Stinson Voyager. Paul du Plooy was awarded for his work in the kitchen by getting his first flight in Rodney Ben's Dornier. We were joined during the flight by Gregory Clegg with Henri Westerman and canine friend Merlin in the Jodel. The sun setting over the lapa under the big tree. From the tasty curry and rice served on the Friday evening to braai on Saturday there was time to explore the beauty of the Lowveld by air and at stages the field were almost empty as pilot's and passengers set out on their own African flying safaris. 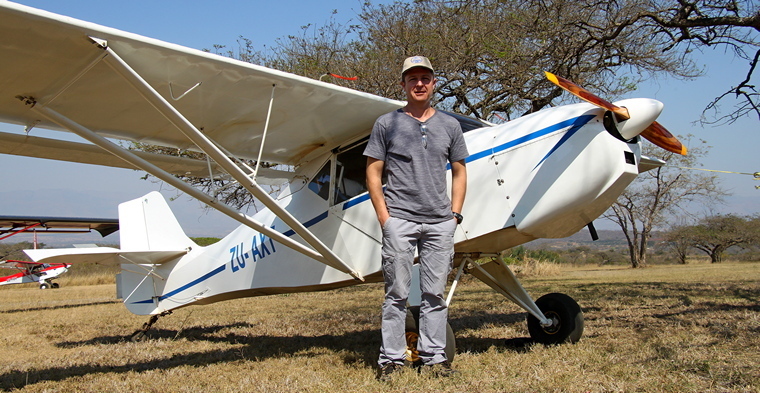 Kitplanes for Africa's Stefan Coetzee flew in together with six other of the company's products. "We left Petit Airfield at about 08.15 on Saturday morning and flew in loose formation to Pyramid. We experience almost no turbulence and the flight lasted approximately 1.5 hours." Stefan said. He also told us that Kitplanes for Africa has have agents in Australia, the USA and Netherlands and has already sold a number of kits in these countries. They have also established a manufacturing facility in the Netherlands. Others opted to remain to just relax, share stories and make new friends in the lapa under the big tree. Pyramid, is no conventional air park. Whilst it is almost compulsory for an airfield to have its own canine resident Pyramid is patrolled and protected by Varkus, the pot-bellied pig here seen hard at work. Mark Wheeler took-off from Petit in his Bushbaby and met up with some fellow aviators at Rhino Park and flew across through the valley at about 7,000 feet. Mark said; "What a superb venue compared to a cold Jhb the weather in the valley is nice and warm and the mountains in the distance stunning. We've got one man tents and ground sheets and are going to rough it." The field has a number of Chalets available but they were quickly snapped up. A shuttle was available to take those that stayed in one of the numerous B &B's in town. Getting people to a fly in is the easy part; making sure that they are fed and made to feel at home the difficult part and that is where Pyramid excelled. Everybody involved in the airpark was on hand to make everyone's visit as pleasant as possible. Will we be back? Without a doubt!